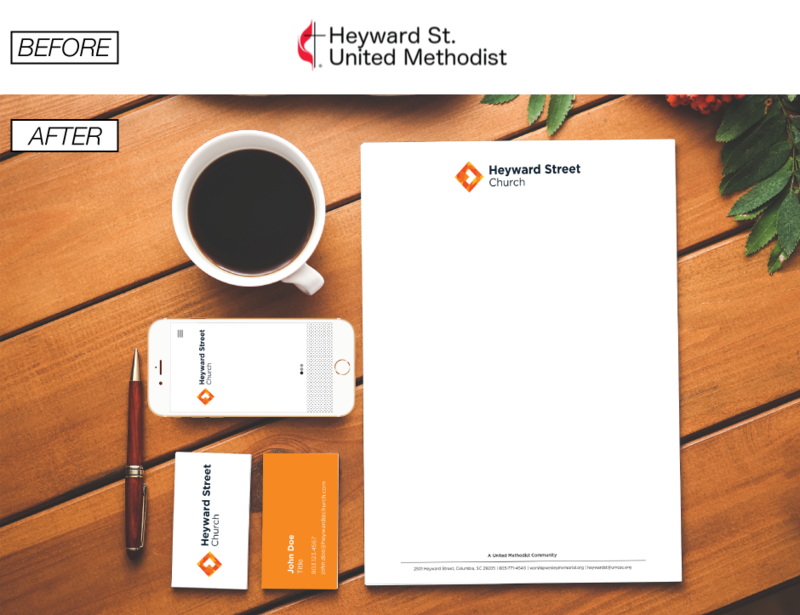 As Heyward Street Church in Columbia, South Carolina, transitioned from a traditional church to a more modern congregation, there was an increasing passion for a brand identity change. The first step was removing the denominational affiliation from their name. Then came a need for a new logo. The congregation of 50 hoped the new branding would be a sign to neighbors that the congregation plans to grow their service plans for the community. Inside the church, the updated look gave members a new ownership of their congregation. When venturing into the rebranding, Heyward Street Church was intentional about the process. They started out with the right people in the room. The group focused on the word “go” as it represented the church’s movement in being mission-minded. From there, the committee members brought together ideas of what a logo could look like. Once settled on a general direction, they met with several local designers to find someone who fit their budgetary needs, but also truly understood the church’s vision. After several rounds of design, which were each followed with constructive feedback, it became time to reveal the logo. Continuing their intentionality with the process, they took to time to tell the congregation the story behind the branding changes. It was the best way they believed they could get buy-in from church members (who later approved the logo in a congregation-wide vote). Throughout the process, Andrew says his church learned three important things any congregation going through a rebranding should be aware of before starting. Keep the committee small, because the bigger the committee the harder it is to come to consensus. Know your budget, but make sure it is an honest one. You get what you pay for a lot of the time. Change is hard for people to accept, but approach those folks with grace and hear them out. There are two pieces of this project that really stuck out to us, making this project a Juicys winner. First, it’s so important to be strategic about branding changes. Often church leaders just say they need a new logo without intentionally thinking about how it reflects the church’s beliefs and culture. Heyward Street Church avoided the trap of looking at a logo as just a cool graphic. Second, Heyward Street Church busted through the old stereotype that good branding is just something for big churches. Every congregation has a unique story to tell and size doesn’t exempt anyone from sharing that with their community. This small church used best practices to create a final product that looks modern. Now that the logo work is done, Heyward Street Church plans to redo their website to match the new branding.